As a thank you, I am delighted to stamp a name, date, initials - whatever you'd like - on the inside, at no extra charge. Please limit it to 10 letters and indicate here what you'd like. TYPE N/A if no personalization needed. 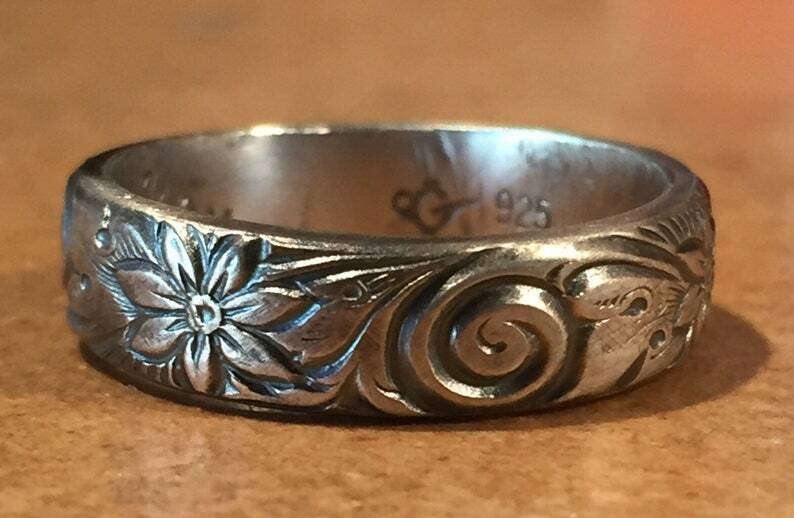 The detail on this patterned silver ring practically tells a story. The gorgeous summer flowers and leaves are divided by a bluster spiral that makes me think of a cold winter wind. When I look at it closely all I can think of is Charles Dickens' Great Expectations quote: "It was one of those March days when the sun shines hot and the wind blows cold; when it is summer in the light and winter in the shade." I hand cut, form, and solder this ring. After a complete polish and silver hardening process I add the patina that makes the silver look oxidized. That way the beautiful pattern pops. OR you can choose to NOT have the patina added if you prefer a shimmering silver only. Comes in sizes 5-11, including half sizes.